This list is comprised of over 20 years screen printing in Saint Louis Missouri. Each year our existing clientele is growing in these categories because more people have a need in these top 10 areas. 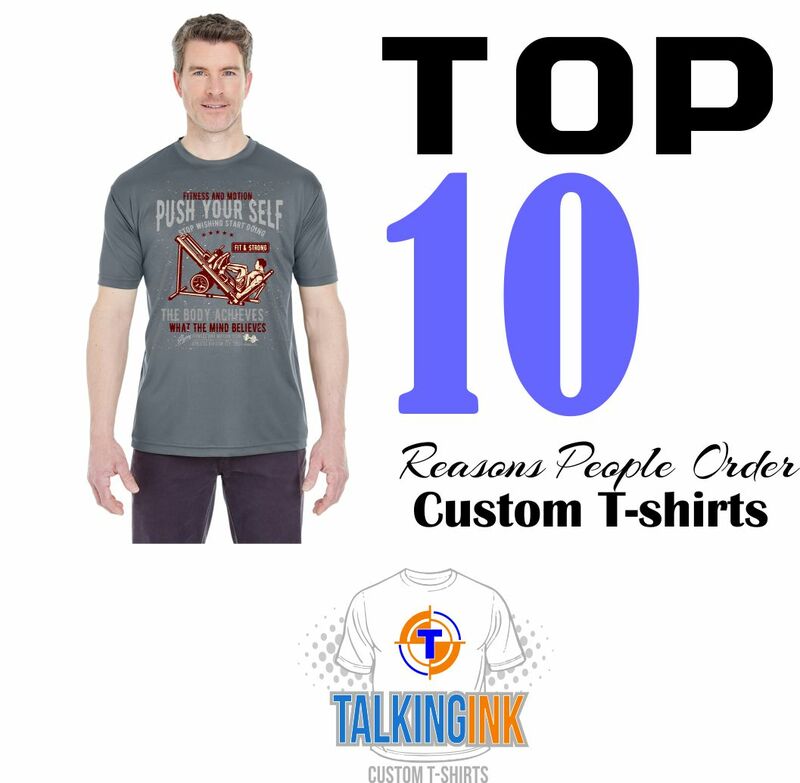 People need custom t-shirts for a variety of reasons, these are the largest group of people who order custom t-shirts. Business across all lines from small business to large corporations order custom t-shirts as a marketing tool. They will also order jackets, polos, oxfords, bags, hats, and more. But they like having their employees wearing marketing material on casual days or when they aren’t in the office. The way small businesses see it is it’s a more professional look having a company landscaping your home or selling you a storage unit. Having employees in matching shirts displays a professional look and when it comes to homeowners, gives them a sense of who these people are working on their homes. By sheer volume business makes us the number one purchaser of custom t-shirts. Schools of all levels order a large volume of logo apparel. Team sports and spirit wear leading the way but on a smaller scale class shirts, clubs, and special events make up the balance. Spirit wear is a great marketing tool and people love to buy it to show pride in their school. While business spans many industries, schools bar non would be the largest single industry of people need custom t-shirts. Fitness companies such as gyms, yoga studios, boxing clubs, and track clubs order tons of custom t-shirts. A lot of times these are giving away when someone signs up for a membership. What better way to market your business than having your memebers wearing your logo around town? These businesses order the trendy styles and the performance fabrics their customers will want to wear. Other times gyms will sell their apparel to their members. It’s a win win for the business and customer. Orgnazations like Autism Speaks, The American Heart Assocation, and Breast cancer awareness foundations order shirts for their participants. However there is a larger volume of those participants who order “team t-shirts” for their participation in these run walk events. It’s a fun way to show off your group of participants and have a custom t-shirt to honor the person you are walking for. Family reunion custom t-shirts were big years ago and they have made a comeback. No matter where people are vacationing, they want to order a special shirt to celebrate and remember the trip. Team sports whether it’s youth sports or adult pick up leagues. We print a lot of custom t-shirts from youth soccer teams to adult softball leagues. Sometimes people go all out and want a profesional jersey but most of the time it’s just a custom t-shirt with names and numbers. It’s an inexpensive way to outfit a team. Something about women and having custom tank tops for their trip to Nashville. It’s a big thing. Each year we do more and more custom tank tops or t-shirts for a group of women for a bachelorette party. Popular destinations are Nashville, Memphis, Lake of the Ozarks, and on occasion and time of year, Gulf shores. No matter the destination the girls love having fun in designing their custom shirts and then seeing their ideas come to life in the form of a finished product. We always have fun with it. We probably do one bachelor party shirt for every 5 bacherlorette shirts. While we do a lot of shirts and logo wear for police, fire, and ems crews, we also get called on for the dreaded end of watch shirts. We’ve garnered a reputation for being the place to call for a fast turn around on first responder shirts that will be used to raise funds for a fallen officer. We enjoy the relationships but it’s never fun when you are printing custom t-shirts for such a solemn cause. We provide them with discounted pricing and are happy to be involved but we appreciate it more when we are simply printing shirts for the fire department or police department for their everyday shirts they’ll wear. Custom t-shirts for birthday parties are kind of a new trend. They make a great attendance prize and families have a lot of fun with it. They are a cool cost effective gift for everyone to remember the occasion. Great for both boys and girls. Even adults too. This is kind of a mix match of various things from concert t-shirts to people wanting shirts to celebrate their 25th wedding anniversary. Event t-shirts of all sizes bring a people need custom t-shirts. We do custom band t-shirts, wedding anniversaries, even fantasy football t-shirts for a group of guys. If it’s event based we print the shirts. Last but not least, except for volume, are the brands. We get tons of people with a great idea for a shirt they can sell. These are always fun and we have a lot of experience with branding so we are always glad to lend a hand in these. It’s great seeing people’s clever ideas and witting sayings. It’s a sink or swim reality but when they swim it’s a fun ride. While there is a large spectrum for people need custom t-shirts. These are the top 10 based on our experience each year. If you are in the market to order custom shirts give us a call and we’ll see what we can do.